Are you tired of putting out fires and reacting in your work and maybe even how you parent if you are one? 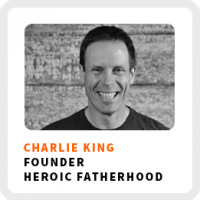 Charlie King shares how you can be a more intentional entrepreneur and parent. He wants to help you respond more to the world around you, instead of feeling like you are constantly reacting to it. Charlie created Heroic Fatherhood as a way to help coach and mentor fathers who want to be more intentional with their parenting. His signature program, The Dad’s Edge, offers guidance, accountability, and support to fathers as they make changes in their life. Charlie is generously giving $100 off to all Life Skills That Matter listeners on his upcoming The Dad’s Edge program! Click here to get this special offer now! Offer expires Friday, October 26, 2018! How being a father has changed so drastically over the past few generations. The biggest challenges facing dads right now. Define your code of honor to understand who you’ll be in the “dark night”. Why more businesses developed through a process, rather than the flip of a switch. Core work activities + habits: 1) Follow up. 2) Intentionality. 3) Planning. Ideal work environment: In places with lots of activity and ambient sound, with inspiration from movement and activity, like a co-working space. Definition of success: The intersection between fulfillment, mission, passion, and income. 90-day goal: To fill his program, The Dad’s Edge, to capacity for the next two rounds. 1) Acknowledge that you’re stuck, that it’s a thing in your head, and that making a change can break it up. 2) Speak it outside of your head to a mentor, spouse, coworker, or anyone you trust. 3) Bring your awareness to how you get unstuck and make note of that for later instances of the same problem. Get $100 off The Dad’s Edge program.